Hearts are heavy this morning all across our country and the world in light of yesterday's tragedy. Watching some of the coverage of the space shuttle's demise took me back 17 years when America mourned the death of those who died in the Challenger accident. Our space program has been an icon of American progress and ingenuity and so to have this happen at a time in history when there is so much uncertainty in the world, makes for a difficult set of circumstances. It is providential, then, that we celebrate the Feast of the Presentation of our Lord today - a feast of great hope and I think we'd all agree that at a time like this, we could all use a nice dose of this virtue. 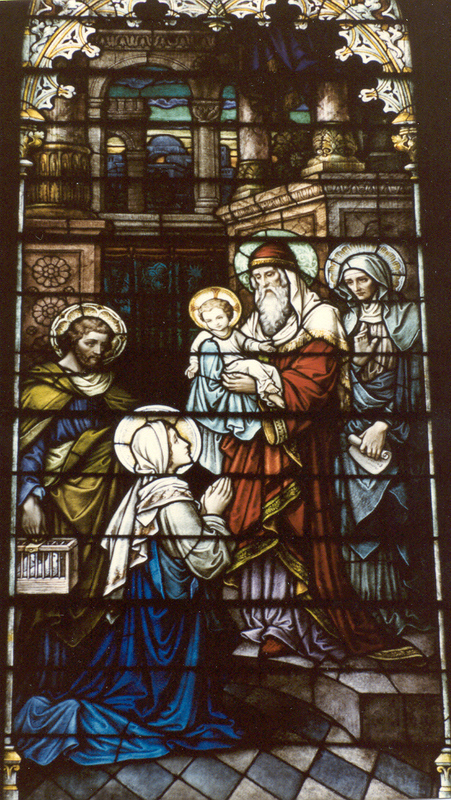 Interestingly, we not only find hope in the Messiah, Jesus the Lord, who is presented by Mary and Joseph in the Temple - we all find great hope in the testimony and lives of Simeon and Anna, two of the Biblical characters depicted in our Gospel passage today. Simeon and Anna are elderly - Simeon was ready to die and Anna was 84, when the Holy Family comes to the Temple. Both Simeon and Anna saw so much turmoil in their lifetimes - crime, war, terrorism, corruption and the Roman occupation of their homeland. Yet, they are not cynical or bitter - they await the coming of the Messiah with joyful expectation. Their hope was based on a faith that they nurtured, by God's grace, within their souls - a trust that God would protect them and come to their aid in a a time of great uncertainty in their own land - not sure of what the future held for their beleaguered nation, which had endured so much suffering. The challenge for us is to adopt the spirit of Simeon and Anna - to not be afraid of what lies ahead because we have a God who surely hears our prayers and comes to our assistance in ways beyond our imagining. We should all pray to have this wonderful trust that inspires the dying Simeon to say, "Now, Master, your servant can go in peace for I have seen the salvation our your people - the salvation that you promised us." First, the infant Jesus in the Temple for the Presentation. The infant presented today cannot know what this moment means. But, his mother knows. She knows that this is not merely fulfilling a prescript of Jewish law - it is not merely compliance of an external law for external judges. It is not symbolic conformity - it is real conformity. It is complete handing over, a pouring out, that is taking place - an unconditional obedience to the full force of God's law. The infant Jesus cannot know this, but Mary knows it. She knows her heart will be pierced and she carries this knowledge to our next scene - when Jesus is Twelve, arguing with the elders in the Temple. In this second scene, the infant Jesus is now a child - full of zeal for His Father's house. He has wisdom and grace and he amazes the Jewish elders by his knowledge and understanding of the Scriptures. And He knows - this time He knows - that He is about His Father's business. But what the child Jesus cannot know, at least in his human nature, is what form this business will take. He cannot yet know that enraged and fearful elders will destroy the temple of His body years later. But Mary must know - she knows her suffering before finding Jesus in the Temple was but preparation for the final scene at Calvary. And still, she wants to present Jesus, her child - in satisfaction for the just demands of God's law. And so the third scene - this time, the Temple is the body of Jesus being broken on the Cross - when the handing over and the pouring out that Mary began in the Temple at the Presentation years earlier - the event we celebrate this - is now coming to completion and fulfillment. These are some the mysteries of our Faith. At times, we find ourselves so full of zeal - knowing that we each must be about our Father's business and yet we are at times so afraid, fearful of what unconditional obedience to the will of God may cost us and how much we are willing to give of our lives to Him. And so again - for you and for me, Mary and Jesus fill sacred space again - this time, in our own Temple here in Vienna. In the Eucharist, Jesus will be present here beyond infancy, beyond youthful zeal and beyond childhood. He has grown to full stature and is present to offer the Temple of His body in Holy Communion for us. Yes, Mary is present with us as well - still consenting to Presentation - still willing to have her heart pierced, but this time - for us. If we would be Christians, grown to full stature, we must allow Mary to present us, her children, to the Father in unconditional obedience to His will. Let us find great comfort and great confidence in knowing that the very mother who willed to present Jesus to the Father, now stands ready, to present us in the same way. May the hope that is grounded in our faith inspire us to continue to trust that peace in the world and in our land can be ours if we consent, like Mary, to greater obedience to the will of the Father.